Hello there! My name is Sheila and I'm an "agility junkie". This is my story about how I got "on the ball"! In my mind, the year 2009 will always be linked to a series of doggie disasters that struck, one after the other. First, tragically and quite unexpectedly, I lost my competition dog just as she was coming into her prime. Then two month later, not altogether unexpectedly, I lost my senior dog. That left my puppy, Kip. Kip is a field bred Golden Retriever with a fine pedigree, selected for the characteristics that would make her a great agility dog. Working with Kip was what kept me going through the summer of 2009. I could see that she had the drive and the intelligence that I had hoped for. Sadly, in November she developed hind limb lameness and xrays confirmed that she had significant dysplasia of the right hip. Because Kip was only 6 months old at the time of diagnosis she was considered a candidate for a triple pelvic osteotomy. She met all the criteria and although we would have to travel to Calgary (7 hours away) for the surgery I felt that it was a good option. She had one good hip and the surgery would stabilize the other hip so that she would be able to lead an active, if not a competitive life. To be honest I really thought this diagnosis was the third and therefore the last in this string of disasters. How wrong I was! The next blow came when we went to pick Kip up after her TPO surgery. We learned that in the course of the procedure, there had been damage to the sciatic nerve - a rare and potentially serious complication. Kip had no sensation and no movement in her right hind leg and in her case it was many weeks before she recovered function. The final blow came when we took Kip in for follow up xrays two weeks after the surgery. The films showed that the left hip was now subluxed and would also require surgery. Taking Kip back to Calgary for that second procedure was very difficult. The decision fell squarely "between a rock and a hard place". The window of opportunity for this surgery is narrow and the best outcomes are achieved when it is done before 10 months of age. Kip still had significant deficits on the right and after the second surgery she would be further disabled. But without the surgery I knew she would face a whole lifetime of disability. Thankfully, our luck was about to change. While she was in hospital for the second surgery Kip was assessed by a rehab veterinarian. The rehab vet found there was significant neurogenic atrophy on the right and profound weakness of the core muscles. She provided us with an exercise program and as Kip's strength began to improve she recommended that we get her "on the ball". Our ball arrived at the end of April. At first I had to lift Kip up and she would just lie on it while I bounced it and rolled it back and forth. It was not long before she could sit and then stand on the ball. 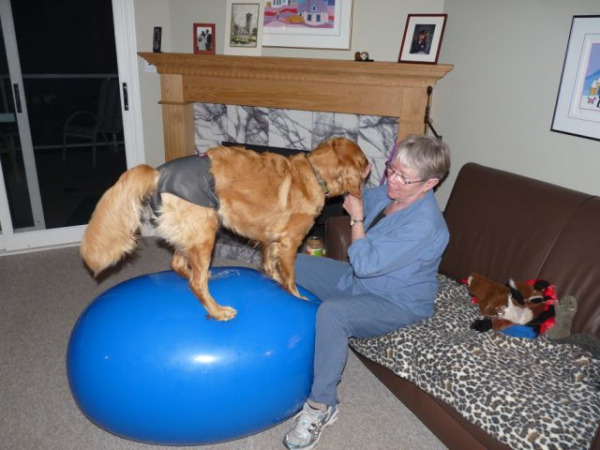 We used functional activities along with the ball and Kip's strength and confidence grew steadily. By June she was back in structured obedience classes, swimming and going for short hikes. In July she attended an agility camp for puppies where she was the star of the body awareness classes! Kip is now 21 months old. She is in a regular agility program and we use the ball as an ongoing part of her training. She is fit and strong and runs like the wind. Every time I see her wrestling with our new puppy, a 10 month old border collie rescue, or watch as she chases him across a field it makes me smile. I am still an "agility junkie". At this point I don't know whether Kip will ever compete in agility but I'm not going to set any arbitrary limits on what she can do. We will just continue to work on building her strength, her coordination and her skills and see where that takes us. I credit the ball work for much of Kip's recovery and the ball will always be a key element of her program. Oh and the puppy. he's "on the ball" too! Many thanks Debbie for all your videos which we have relied on and returned to over and over again. Thanks too for helping us to get our ball - I believe it has made all the difference.